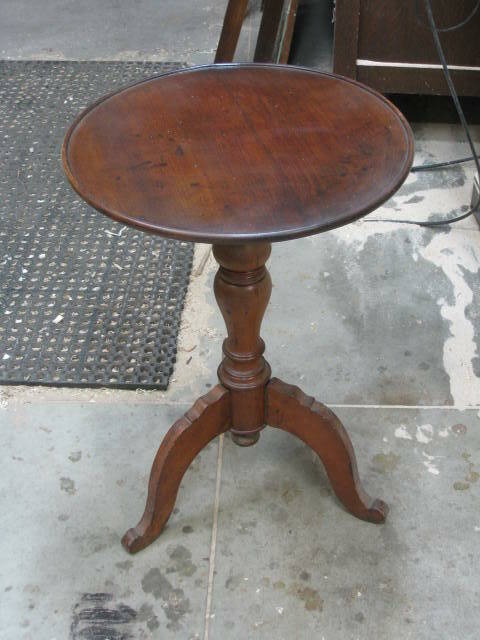 One of the most common questions I receive is “can you remove the warp from this_____” fill in the blank with something like table leaves, drawer bottom, or table top. The answer is always the same. ” That depends”. Anything can be fixed if you are willing to spend enough money. However sometimes it’s just not worth the effort and it’s just easier to replace the part or the whole piece. In this post I’m going to talk about a method of straightening a warped board, it doesn’t always work, but many times it does. 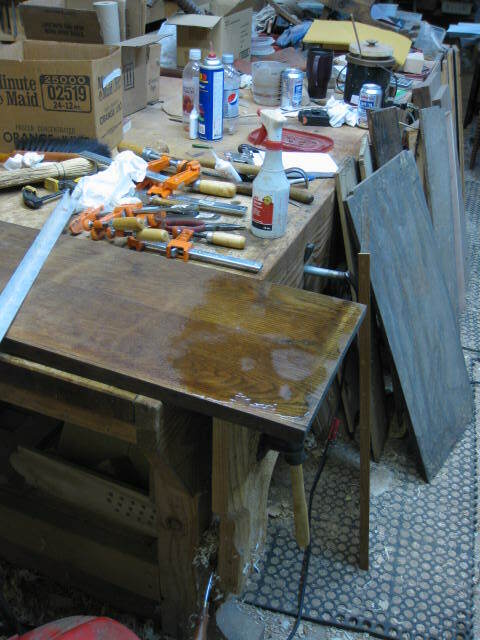 If you are going to try this don’t start right out with your dinning room table or your grandmothers antique desk, practice on scrap boards until you have had some success, this is not as easy as it may appear in this post. Wood is made up of cells that are many times longer than they are wide. The vast majority of the long cells run parallel to the center of the tree. These cells are hollow. Imagining the wood as a bundle of straws is a common way to illustrate the structure of wood. However you must imagine the straws with closed ends and varying length to be a little more accurate. When the wood is in the tree it contains two kind of water , free water, the water in the hollow part of the straw and bound water the water that is locked in the walls of the cell. Wood in the tree can contain as much as 75% or more water by weight depending on the species and the time of the year. When the wood is cut from the tree, first the free water begins to evaporate, when all the free water is gone but none of the bound water, the wood is at the fiber saturation point, it will be around 30% moisture depending on the species. As the wood continues to season it begins to lose bound water until it is in equilibrium with the relative humidity of where it is located. As the bound water evaporates the cell walls begin to shrink and continue until the wood stops losing water. As the cell walls shrink, the over all dimensions of the wood shrinks. If the relative humidity where the wood is located goes up the cell walls begin to absorb moisture again and begin to swell, as the cell walls swell the over all dimensions of the wood increases. This is what we call seasonal wood movement and it will take place when ever the relative humidity changes, it never stops, ever, finishes will slow it down but not stop it. If one side of a board is exposed to more moisture than the other side, the wet side will expand more than the other side and cause the board to warp or cup. If the cells cork screw through the board as they expand and contract the board will twist and untwist. Now I know you are saying if this is true why doesn’t a cupped or warped board flatten back out. The answer is compression set. When a piece of wood is confined and it absorbs moisture it tries to expand but can’t, when it can’t expand the force crushes some of the cells, with the cells crushed it can no longer expand and contract fully, keeping it warped or compressed. 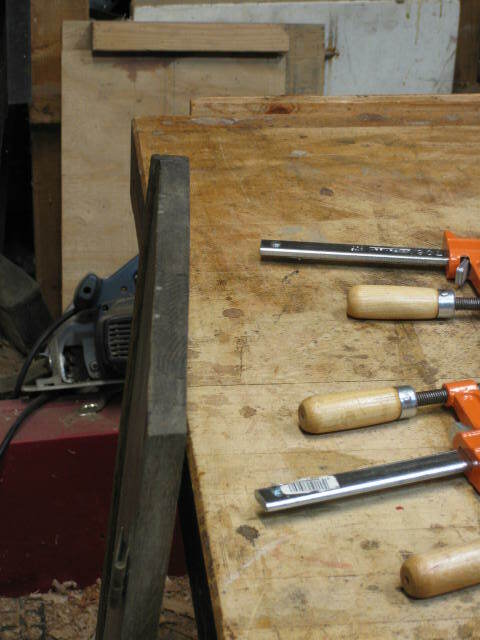 Compression set takes place whenever the wood tries to expand and is restricted. It also takes place when one side of a board tries to expand and the other side does not. This is normally caused by uneven moisture exposure. Compression set also explains why joints loosen over time. It is the explanation of most cracks, loose screws, loose nails any thing that restricts the movement of the wood can cause it. When wood tries to shrink from loosing moisture while it is restricted it will crack, check or split at the weakest point. It will split many times where it was punctured with a peg, nail or screw. 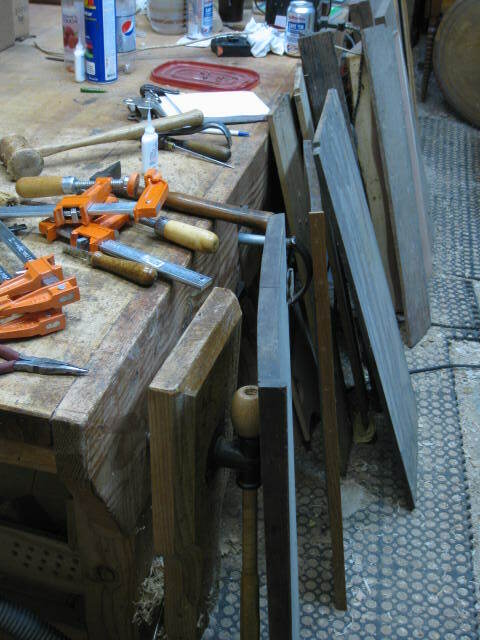 A wide plain sawed board will split most often in line or near the cathedral grain. A warped board may be caused by other issues like reaction wood, but most warping is caused by moisture or heat and compression set. Common knowledge says to straighten out a warped board we need to apply moisture to the concave side of the board, and if enough moisture and heat are applied to the concave side, the board will temporarily straighten out. However as soon as the introduced moisture dries out the board will go right back to the warped position or may even warp more if the process causes increased compression set. The best chance of removing a warp is to introduce a compression set to the convex side of the board by introducing moisture to the convex side while the board is restrained from moving. This can be very time consuming and difficult if the warp is severe. 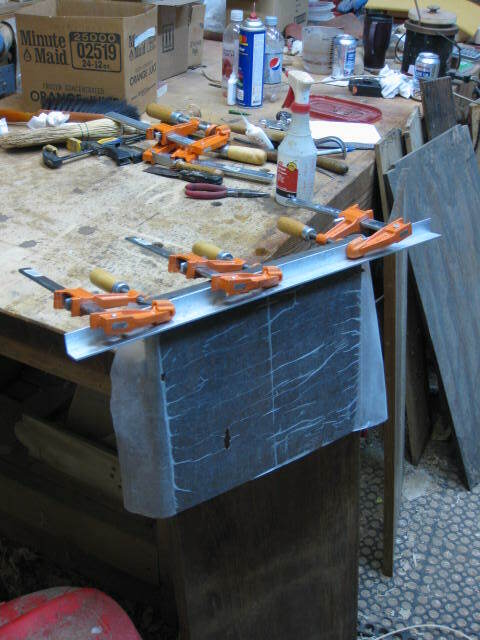 A technique I have used with some success with small tops and drawer bottoms is, 1. clamp the board straight with clamps and heavy aluminum angle irons so it is unable to move. 2. Lay the piece on the damp grass with the concave side up for a period of time, the length of time depends on how sever the warp is. 3. 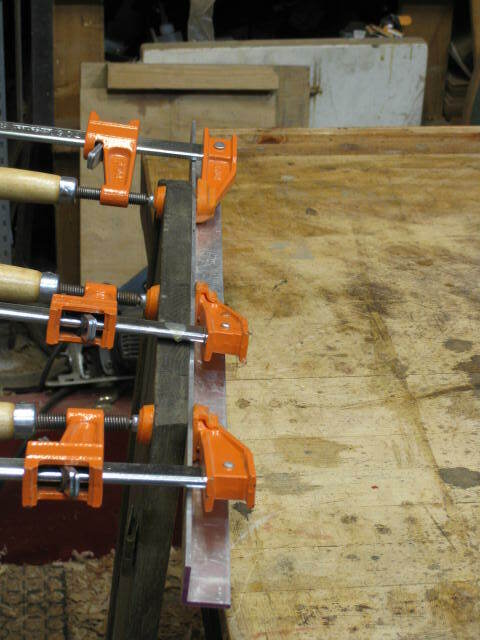 Leave the piece in the clamps in the shop until it is in moisture equilibrium. 4. Repeat until it is straight. A similar process can be done with steam, or even damp blotters. Here is the carcass of an Arts and Crafts stand up desk. This is the warped lift top of the desk, it’s only warped on one end. Here I have wet the convex side of the warped end. The wet end has been covered with wax paper to allow the water to soak in rather than evaporate. It was then put in the sun with the concave side up for several hours. Only the warped end was in the grass the other end was on dry concrete. The second day it went back on the grass the same way but it was turned over every two hours all day. It then went back into the shop for several days until it was in equilibrium. I used a moisture meter to compare the top to the rest of the desk when they matched I took off the clamps. Clamps removed, it’s not perfect but it’s much better than it was. The top of this candle stand was straightened using this method. I forgot to take a before picture, you’ll have to trust me, it was quite warped. This entry was posted in wood movement and tagged compression set, fiber saturation point, furniture damage, moisture damage, repairing a warp, twist, warp, wood movement. Bookmark the permalink. My father was a painter and I remember him doing something similiar with bowed window sash. I have tried to straighten out a few pieces and sometimes it worked and sometimes I had firewood. Interesting and informative as it gives me a few tips to try that I wasn’t using. I am trying to straighten a cupped single piece drawer bottom from an old American Chestnut chest of drawers. I have tried wetting the convex side, placing the wood (wet side down) on a piece of scrap carpet under weights. After a day or two I remove the weights. 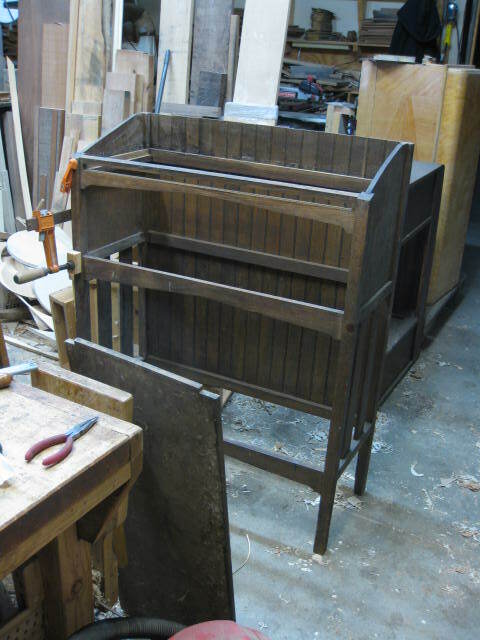 This method temporarily removes most of the warp, but within a day or two the wood rewarps, perhaps even more acutely. I have read several accounts that use your method of laying a piece of damp wood on grass. The woodworkers seem to have usually wet the concave side of the board and placed that side down onto the grass. I am intrigued that you have applied water to the convex side of the wood. It seems somehow counter intuitive, although I am certainly not about to argue with your results. Would you please elaborate on what you think is going on within the wood, so that I can apply your method to my problem? The solid top to this chest of drawers is also somewhat warped and I am hoping to apply what I learn to that piece also. Additionally, I was wondering if you thought that applying an oil based finish to one side would aid in the straightening process? Would a finish help keep the boards flatter in the long term, perhaps a shellac for interior boards? Thanks so much for posting this very pertinent information. Steven, here is a link to a WAG paper on using compression set to correct a warp. If you have further questions let me know. Thank you millcrek for the reference. It is both clear and informative. I will let you know my progress. Steve. Thanks for this unwarping method. I’m definitely going to give it a try next time — I face the warping issue quite frequently. Actually, I have several pieces of plywood that are warped slightly from being in volatile outdoor conditions on my property, and I want to try to salvage them before tossing them. When I started looking into solutions, I realized that I needed to know more about why wood warps – I came across a page on Carve Your Creation that offers some similar information, but I find that your page here to be much more insightful. It’s not my site, but I hope you don’t mind if I share the link. Anyway, what would you say is the best method to start with if the degree of warping is minor to moderate? Is your method here best to try in pretty much all cases? Thanks again. I have not found any method that always works, this method seem to be the best I have tried.